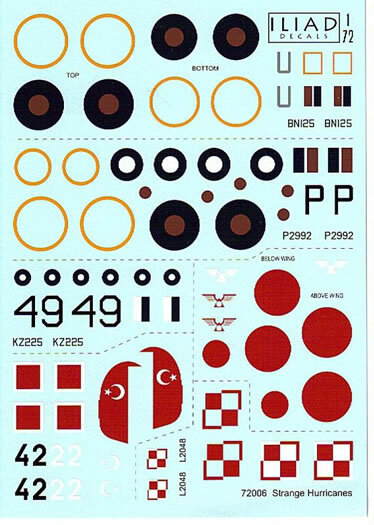 Iliad Design has produced a new decal sheet in 1/72 scale for six Hawker Hurricanes in unusual colour schemes or markings. Hurricane Mk IIb; BN125 681 Squadron, India, February 1943 in an overall Dark Mediterranean Blue scheme. Hurricane Mk IV; KZ225 1 (Indian) Service Flying and Training School, Ambala, 1946 in an overall painted aluminium finish. 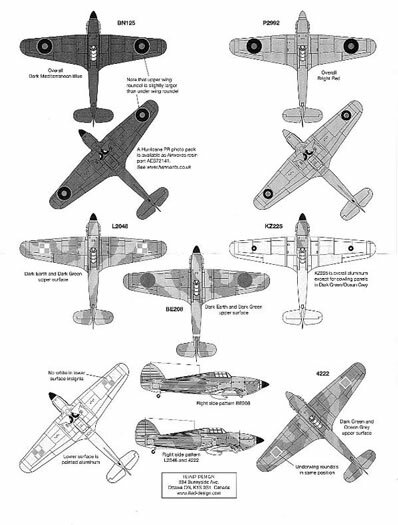 Hurricane Mk I; L2048 in notional Polish AF scheme for evaluation in July 1939 in the then standard scheme of Dark Earth, Dark Green uppersurfaces and aluminium lower surfaces. Hurricane Mk IIb (trop); formerly BE208 of 232 Squadron, Singapore and captured by the Japanese in the then standard scheme of Dark Earth, Dark Green uppersurfaces and sky lower surfaces, with JAAF Green used to overpaint the roundels/fin flash. Hurricane Mk IIb; 4222 Turkish Air Force, September 1943 in the Day Fighter scheme of Dark Green and Ocean Grey uppersurfaces and Medium Sea Grey lower surfaces. The decals are crisply printed on thin carrier film and all insignia show excellent density and registration. Where appropriate, decals are supplied as separate components to minimise registration issues. There is a minimum of markings to apply for each scheme, making this sheet an ideal choice for those who wish to achieve a quick yet remarkable build. 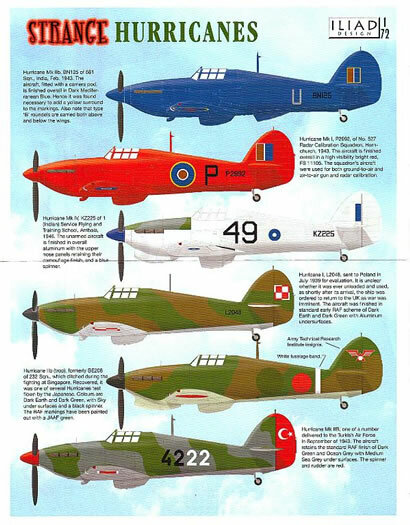 Iliad Design is to be commended for producing another sheet with such variety and interest. Thanks to Iliad Design for the sample.